Despite the fact that it’s April Fools’ Day, Tim and Scott aren’t fooling around in this week’s episode of Monday Madness. Or at least not more than usual. In fact, after the incident of April 1, 2017, when some people were taken in by the SEC’s announcement that Lent Madness was canceled, we have learned the hard way not to attempt such things with the Lent Madness global viewing public. You always know Tim and Scott are desperate for things to talk about when they dip into their Santa sack-sized bag of viewer mail (editor’s note: the use of the term “Santa” is not an endorsement of St. Nicholas of Myra). In today’s show, you’ll learn what surprised the SEC in the first round, whether or not they make predictions about the outcome, and what they eat to celebrate saints’ days. (Spoiler alert: nothing, because Lent). 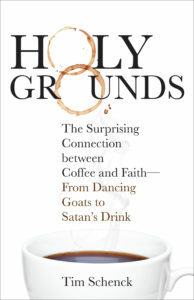 If you continue watching this Gandhi-like episode (in length, not content), you’ll hear Tim blabbing about his new book, Holy Grounds: The Surprising Connection between Coffee and Faith—From Dancing Goats to Satan’s Drink, which releases tomorrow. You can buy it at most disreputable booksellers or on Amazon. You may recall a few episodes of last year’s Monday Madness filmed from his sabbatical in exotic locales, such as coffee farms in Nicaragua — this book is the caffeinated fruit of that labor. 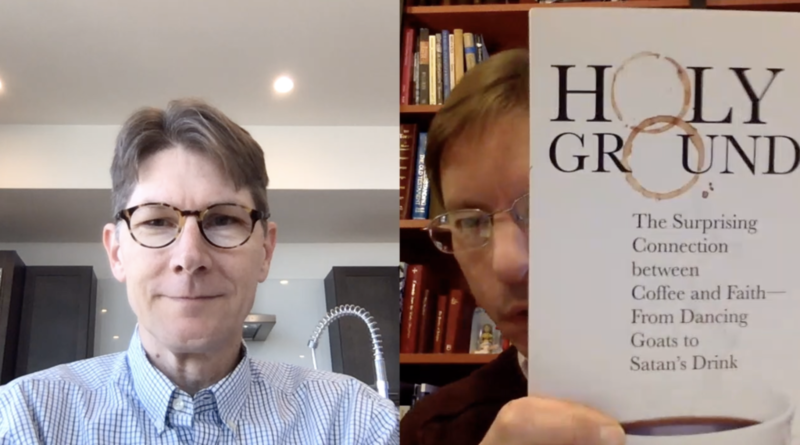 Of course, Scott didn’t let Tim self-promote without making sure our viewers know about his two recent books, co-authored with Melody Wilson Shobe (Walk in Love: Episcopal Beliefs and Practices and Faithful Questions: Exploring the Way with Jesus). You can get Scott’s books from Forward Movement (here and here) or Amazon (here and here) or your local bookseller. This photo is here to help with your social media sharing. You do share these posts, right? Right?! 7 Comments to "Monday Madness — April 1, 2019"
If buying your book and sharing it with our church family will, in any wildness of the imagination, spur them to become volunteers for the Holy Cause of the weekly Coffee Hour, I will do so with joy, so that they may serve the hordes with gladness. Tim, is there any indication in Scripture (or any other holy writ besides your book) that Jesus was a coffee drinker? Is it not possible that, in the great Anglican tradition, he would have preferred tea along with cucumber sandwiches and scones with clotted cream and strawberries? Do we have any evidence that Jesus meets persons at the Urn? Is there more conversion at the Tea Cozy or at the Coffee Spigot? Though Tea during a “Gospel Preview” does quiet the distractions of the day and aid the contemplative digestive process. I like light roast, low acid coffee with milk. Use paper cups for your coffee, not styrofoam! Better yet, use ceramic mugs like we do at St John the Baptist Episcopal Church in Portland, Oregon. I find the theme music for Lent Madness “intriguing”. Where might I locate an audio copy …is it on You Tube? If so, it is called Lent Madness Theme music. ?